As Europe belatedly gets around to repairing its weakest banks, investors who have lent to financial institutions by buying bonds face a brave new world. Their money can effectively be confiscated to plug balance-sheet holes. Recent events in Portugal suggest that the authorities should be wary of treating bondholders as piggybanks, or risk destroying a key source of future funds for the finance industry. Picture the scene. 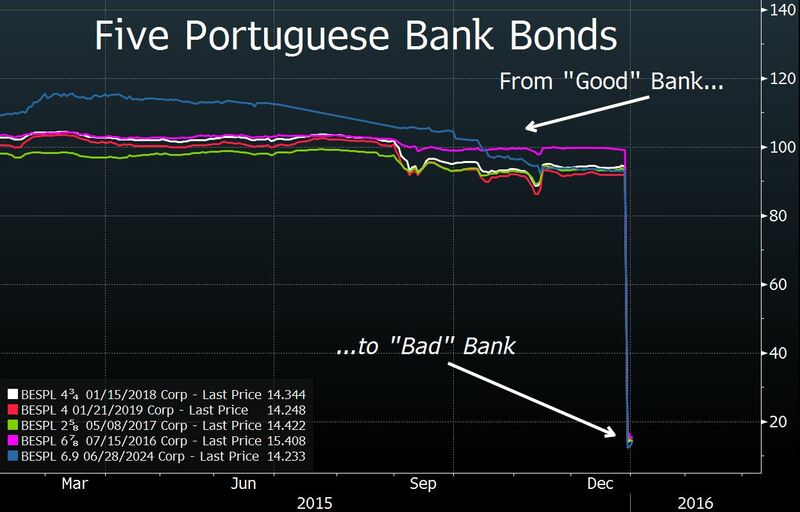 You left the office on Dec. 29 owning Portuguese bank debt that was trading at about 94 percent of face value. In less than 24 hours, you lost 80 percent of your money. So what happened? Last year, Portugal divided Banco Espirito Santo, previously the nation’s largest lender, into a “good” bank and a “bad” bank. If you owned any of those five bonds on Tuesday, you were owed money by Novo Banco, the good bank. On Wednesday, you were told that your bonds had been transferred to BES, the bad bank. The Portuguese central bank selected five of Novo Banco’s 52 senior bonds, worth about 1.95 billion euros ($2.1 billion), and reassigned them — thus backfilling a 1.4 billion-euro hole in the “good” bank’s balance sheet that had been revealed in November by the European Central Bank’s stress tests of the institution. At the time of those tests, the value of Novo Banco bonds rose because the capital shortfall was lower than some investors had feared, and the good bank was widely expected to be able to mend the deficit by selling assets. Instead, the Dec. 30 switcheroo means selected bondholders are footing that bill. Here is where the shoe pinches. The documentation for senior debt typically stipulates that all such debt is what’s called “pari passu”; that is, all securities rank equally, and none should get preferential treatment. But by moving just five bonds off the healthy bank’s balance sheet, Portugal has destroyed the principle of equality between debt securities. There’s nothing inherently wrong with “bailing in” bondholders who’ve lent to a failing institution. It’s certainly preferable to the old solution of using taxpayers’ money to shore up failed banks, and it’s enshrined in the European Union’s new Bank Resolution and Recovery Directive, which came into effect on Jan. 1. But the principle of equal treatment for ostensibly identical securities is a key feature of the bond market. If investors fear they’re at the mercy of capricious regulatory decisions in a restructuring, they’ll think more than twice before lending to banks. It seems likely that Portugal’s choice of bonds wasn’t completely arbitrary; the documentation for the selected securities says they are governed by Portuguese law, rather than U.K. or U.S. law. It may well be easier to fight any ensuing lawsuits in Lisbon rather than London — and there are already reports that investors are threatening legal action. Moreover, Portugal isn’t the only country refurbishing its banking industry. Germany’s savings banks will need to bolster their capital in the coming months under the new EU rules, and the fourfold increase in bad loans held by Italy’s banks since 2008 means the central bank there has some housecleaning of its own to do. Consolidation — in the form of forced intermingling of stronger and weaker banks — is likely in both countries. Investors who own debt issued by German or Italian banks will no doubt reflect carefully on what just happened in Portugal.